On July 15 23,000 workers at the Misr Company for Spinning and Weaving, Egypt’s largest textile company, went on an open-ended strike. 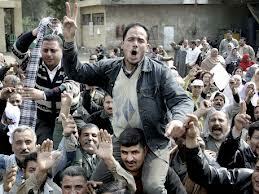 It was the first strike at that company since the popular ferment that bought Mubarak’s rule to an end. The strike was in reaction to 12 months unpaid profit-sharing payments. Alongside this the workers wanted the removal and replacement of leading figures in the Egyptian Holding Company for Textile Industries, purging of layers of upper management, improved medical services, rise of living expenses payments, increased investment in the large but faltering textile company and a minimum wage of LE1200*1*. Another struggle last month (07/2012) involved hundreds of striking workers from the Al-Samoly Company for Spinning and Weaving in Mahalla who blocked a road in protest. There demands were to do with late wage payments, wage increases and better incentives. They were attacked (July 21) which resulted in one death and injuries to many according to media reports*2*. In the aftermath of that incident a local leading ‘brother of the 1 per cent’ as Business Week dubbed the Muslim Brotherhood*3*, visited the workers under the pretext of finding out what their demands were, when the demands were already published in the newspapers. The real purpose of the visit was to contain the struggle from getting out of hand. There were also struggles around similar grievances in Alexandria, Mahalla and other cities in the Nile Delta. The origin of most of these struggles is that owners in industries privatised during restructuring have reneged on their obligations regarding wages, over-due bonus payments and other supplements to workers income. This economic restructuring undertaken since 1991 with the encouragement of the World Bank led to a steady 4% growth rate. But this didn’t produce any increase in the standard of living for ordinary people in Egypt. In fact according to the World Bank, the opposite is the case, more then 40 per cent of all Egyptians live on or near the poverty line. The wages earned by most manual and white-collar workers is insufficient for meeting their basic needs and providing for their families. Running in tandem has been the massive spike in food prices, which chews up around 50 per cent of an average families expenditure where inflation for the three years 2008-10 was 16.2%, 12% and 10% respectively. It is no surprise then that some will look back at the Nasser period with rose tinted glasses, considering that the safety nets that existed under Nasser are well and truly a thing of the past. Workers that are not ‘lucky’ enough – a perverse fortune no doubt for those who enjoy it! – to be in formal employment, are forced to either migrate to find employment or seek work through the informal economy. Those that have settled jobs are a minority of the working-class in Egypt. The vast majority, such as those in Cairo’s slums for instance, depend on the informal sector for their existence. Independent Unions or Workers Autonomy? Kamil Aba ‘Ayta*7* who was elected president of EFITU in January 2012 and his associates want to get their feet in the door, in order to have unions recognised as a way of consolidating their position as spokesmen for this movement. In order to achieve this they place an emphasis on the political process. Kamal Abbas*8* mentioned above, and his supporters are focused on educating workers in “the democratic trade unionist tradition” and building from below. Consequently they have prioritised this over seeking to have labour candidates elected to parliament. Both of these approaches are oriented toward getting themselves incorporated into the ‘new’ Egypt. They represent two sides of the one coin: reformism. The former the political, and the latter, the economic side. But the “new” Egyptian state , no less than the previous one is part of a crisis-ridden global capitalism. No amount of new institutions or set-ups can alter the increasingly desperate situation of the working class. All this points to the urgent need for workers’ struggling in defence of their immediate situation not to limit themselves, either politically or economically, to a reformist perspective, but to adopt a class perspective. This means an orientation towards developing organisations that can reflect the interests of the working-class and the non-exploiting part of society as a whole. They will have to go beyond the ultimate dead end of Nasserism, ‘democratic trade unionism’ and the soft-Islamism of the Muslim Brotherhood who collectively lie in wait to exploit the inspirational struggles that Egyptian workers have fought over the last decade. And when the Egyptian workers have their own autonomous political organisations linked to the rest of the international working class we may have a chance of human emancipation, not just a recognition of our exploitation in existing society. 7 libcom.org. Kamal Abu ’Ayta has been a member of the Nasserist Karama (Dignity) Party which was not recognized under the Mubarak regime. In the 2011 parliamentary elections Karama joined the Muslim Brotherhood-led Democratic Alliance and won a seat in parliament. 8 Ibid. Kamal Abbas abandoned ‘party politics’ after his involvement in the 1980s in the illegal Peoples Revolutionary Party. He is suspicious of the Muslim Brotherhood due to their anti-union activity stretching back to 1940s and because of their position on gender relations. His group Centre for Trade Union & Workers Services (CTUWS) is a NGO, not a union. I like this article and it's title: The struggle for a meaningful existence. MEANINGFUL EXISTENCE is a great idea. Even having a job now doesn't contain anything "meaningful" in any real sense. Even having a fairly reliable wage doesn't supply anything beyond the most basic necessities (if you're lucky), doesn't supply security, and, as regarding anything truly meaningful beyond that, like a future to look forward to ...well, forget it! The most meaning workers can get from capitalism now,is a fairly comfortable penal servitude, along side others serving the same life sentence.